You’re here because one of your tenants is either late in paying the rent or they have stopped paying the rent altogether and are now several months behind. We are eviction attorneys that understand your problem and can not only help you through the whole eviction process but we can also save you time and money as well. It can be complicated, when it comes to legal cases, your case should be taken very seriously because and your lawsuit will be presented before a judge in a courtroom, who will then make a final decision based on the evidence presented. Let us represent you. It’s important to know the whole system and how it works. Everything from dealing with the tenant to the handling of every aspect of the eviction process. If you get any of these things wrong, it could cause you to start the eviction all over again and be very costly. We have the specific knowledge that’s needed in Hialeah and all of Dade County with experience in handling our client’s cases. There are sometimes when the renter is stringing you along and trying to buy more time to not pay rent our process will eliminate such people and bring their schemes to a quick halt. Allow us to step in on your behalf and serve them with an eviction notice. Suddenly they realize that they are no longer dealing with the Landlord but are now facing a professional third-party that means business. As soon as they see this they know that their options have just run out. The fact is we leave them with only three choices, pay the rent, move out, or get evicted. If you have already delivered your notice to vacate and need an attorney to begin the court process then we are your best option. With years of experience and many successful cases, we will give you the best representation available so that you can get started with getting a new lease on your house. Occasionally, you could have a tenant that wants his day in court. That’s when you really need us on your side. We know and understand all of the eviction laws for Hialeah and all of Miami Dade County, and we will use them to evict your tenant from the property. It’s important to note that the courts have very clear instructions regarding the proper performance of an eviction. If for some reason you don’t get it right, you could actually end up paying for your tenant’s legal fees and starting all over again. So, let us handle your eviction while you concentrate on less stressful things. Give us the chance to get your rent or your house back. Call us for a free consultation on how we can make being a landlord a lot less painful. Call 305-328-8550. We have years of successfully executing tenant evictions. Hiring an attorney is always a good idea when there’s so much at stake. So consider hiring us as your attorney in order to get this eviction done quickly. That way you can get back to taking care of your business instead of wasting all of your time with one bad tenant. Let us deliver the proper “Eviction Notice” for you. It’s just a fact that when a landlord tells a tenant to pay their rent or they will be evicted, most renters will waste time and not take it seriously. But when the tenant receives a “Three-Day Notice to Pay or Vacate” from a Lawyer, That’s when we will see results. Everyone knows that an eviction notice sent from an attorney’s office, with an ultimatum clearly stated on it, means that it’s time that they had better take it seriously or be ready to move. Now, you could always represent yourself in court, but if you do anything wrong you could easily lose the case, meaning that you’d have to start all over again. That could get expensive. So, another good reason for hiring representation is that it reduces the chances of you losing the case and therefore having to pay for all of the court costs, including the tenants. Not to mention losing more rent and time and refiling fees, etc. 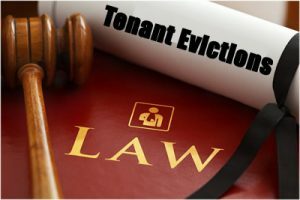 The law is on your side of this issue but in order to prosecute an eviction case properly, you have to be prepared for the seemingly small issues that can, in fact, show up and disrupt your case. By allowing us to be your agent we will help you to avoid the many snares that you might run into along the way. So, don’t wait any longer. Give us a call and we can get started with relieving the pressure that a delinquent tenant can cause in a landlord’s life. Imagine how nice it will be to get this renter out and find good tenants again.